There can’t be many places on the planet that are better to visit to view wildlife in the depths of winter than they are in high summer, but Mull might just be one of them. Don’t get me wrong. Summer, spring and autumn are all lovely and the wildlife is here throughout the year. But a winter’s day on Mull can be magical. With shorter days, the island’s wildlife has to pack a lot in and the longer evenings mean more time for you to pull the chair up by the fire in your Isle of Mull Cottage. Pour yourself a dram of Tobermory malt and open a good book to plan your next day spotting the winter wildlife that is here. Winter is so good because all the young eagles that fledged last autumn are now confident on the wing and will be joining up with other young eagles. White-tailed eagle immatures and sub-adults in particular are very sociable. They will often cruise around together in small, loose groups. It’s not unusual to see 4 or 5 young sea eagles out on an off-shore skerry at this time of year, but bigger gatherings of 10 or more have been reported. Young golden eagles will often join these youngsters, especially at roost time. Meanwhile the adult eagles will be busy visiting old eyries, preparing for next spring and re-establishing their territorial boundaries through dramatic displays and calling. The red deer are now long past the rut and have settled into their winter routine. They’re often down off the hills. With them being lower in the glens, they are easier to find. Stags will have forgotten the testosterone charged battles of the autumn and ‘buddy up’ with each other in small herds. The hinds and this year’s calves will do the same. It’s a harsh existence for winter wildlife, the deer included, but the most testing time of late winter is yet to come. Meanwhile the island’s fallow deer herds at Loch Buie and Gruline are also often glimpsed from the roadside or as they skip across the road in front of you. Deer are often near the roads at night especially, so beware. Offshore, harbour and grey seals are all around Mull’s 300 miles of coastline. Pupping for the greys on the Treshnish Isles is over now, so they can pop up anywhere. Salen Bay is still your best bet to spot the harbour seals. Winter thrushes have largely moved through, stripping out berries as they go, but many remain. Winter wildlife also heralds new arrivals, with rare Greenland white-fronted geese on the Ross of Mull and barnacle geese on Inch Kenneth. It’s always worth a scan of the native, resident greylag geese flocks in case a rare vagrant has joined them. So whatever the weather this winter, Mull has it all. From spectacular wildlife and scenery to wonderful places to stay cosy and warm on the days that look less inviting to venture out… my advice? Go out anyway. The weather will change and the winter wildlife is all there, just waiting to be discovered. Enjoy! Getting to Mull by Ferry, Plane, Car and More! 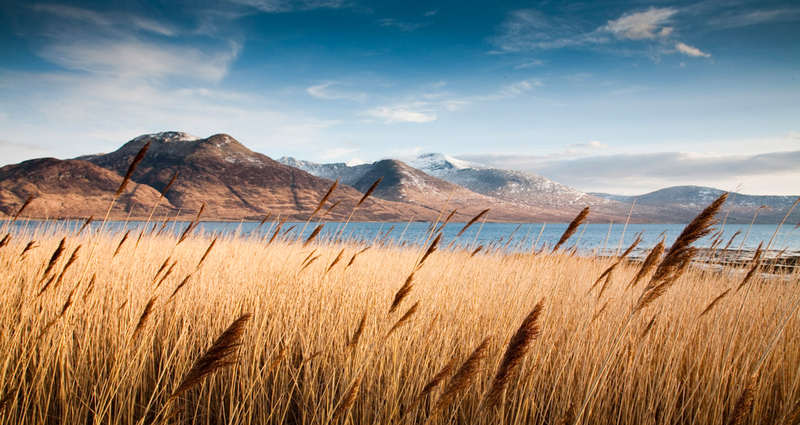 The wild and rugged Isle of Mull is one of the most accessible of the Inner Hebridean islands. 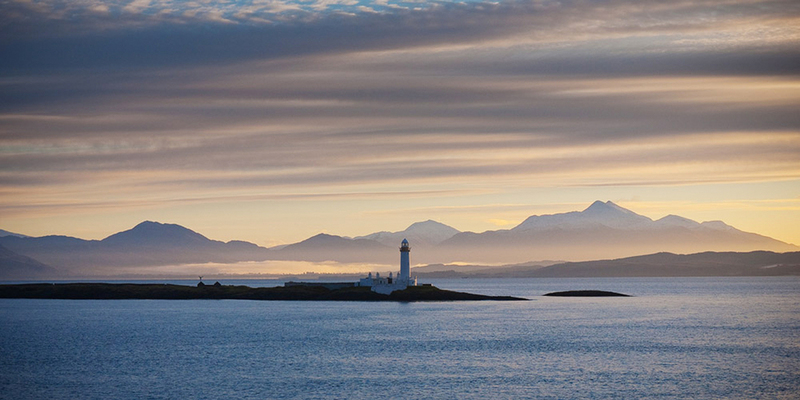 It lies only a short ferry ride away from the pretty port town of Oban on the west of Scotland. Even though the island, with its craggy shores, inland lochs and high peaks, has managed to keep a remote charm about it, cheaper and more frequent ferries mean that getting to Mull is now easier than ever. For overseas visitors, the international airport at Glasgow is just a couple of hours’ drive away from Oban, meaning you can make the hop to the Isle of Mull for a relaxing break in no time at all. The journey to the Isle of Mull is all part of the fun. It begins in Oban, a small port town perched on the west coast of Scotland. Arrive with a couple of hours to spare before the ferry and you can visit the legendary Oban whisky distillery, have a dish of delicious, locally caught shellfish on the pier, and watch the fishing boats bobbing in the bay. In the summer, the ferries to Mull leave around every hour. With the new scheme, a ticket is now around half the usual price for a car journey, making trips more affordable than ever. Hop on the ferry, take in the views and the fresh sea air from the top deck and enjoy the cruise through the islands as you travel to the Isle of Mull. Around half way through the ferry journey to Craignure on the Isle of Mull, you’ll pass on the right hand side the beautiful lighthouse at Lismore, one of the smaller islands in the Inner Hebrides. This island lies long and narrow in the waters of Loch Linhe. Beyond the island, and on a clear day, you’ll be able to see the highest mountain in Britain, Ben Nevis, surrounded by the rest of the Grampians. In winter, these are white-peaked and make for a beautiful backdrop as you cruise towards Mull. Travelling onwards, the rocky ridges of Morvern, the most westerly part of mainland Britain, come into view as the ferry travels up the Sound of Mull towards Craignure. In summer, whales, dolphins and porpoises swim these waters, so be sure to take a boat trip out to see if you can catch a glimpse of them. 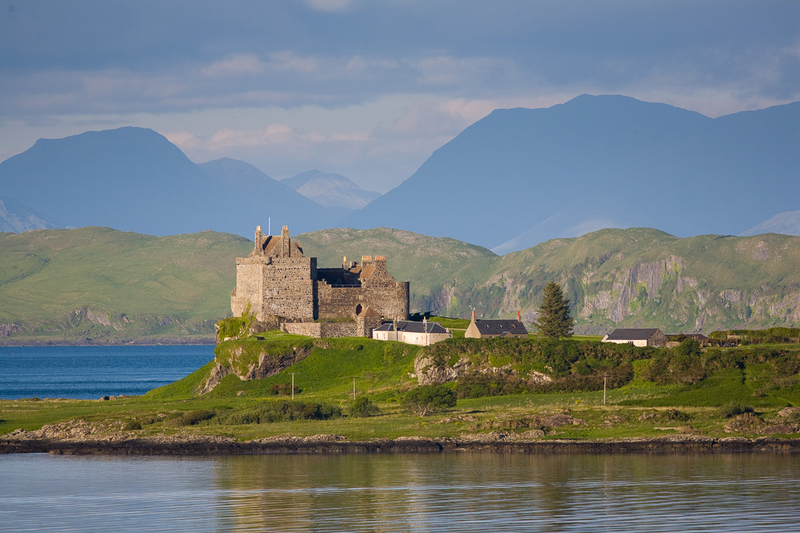 When the stone edifice of Duart Castle, a 13th-century castle perched on the rocky shores of Mull, looms into view, you know you’ve nearly arrived on the island. Getting to Mull takes just 45 minutes from Oban to Craignure, but whether you’ve been taking in the view and sunning yourself on the top deck or watching the landscape pass by from within the cosy ferry bar (if the weather is being particularly Scottish! ), you’ll already have started to enjoy your holiday. Once you arrive on Mull, it’s just a few minutes before you’ll be heading toward your chosen Holiday Cottage The majority of the roads on the island are single track and offer a great way to see the landscapes and wildlife of Mull. Just remember to allow cars behind to pass using the passing places provided. Car hire is available on the Isle of Mull, though with limited availability, so it is worth booking in advance. West Coast Motors operate the island’s main bus services and there are taxi services here too. Bicycle is another good option for exploring Mull once you are here. Mull Electric Bikes offer electric bikes for hire and can deliver them to your cottage. A range of mountain and road bikes can also be hired from On Yer Bike in Salen. You can also find more information and contact details for getting to and travelling around the Isle of Mull on this page.